There's that charming sound to the spoken French language that everyone finds utterly delightful. How the words seem to melt together to form pleasant sounds and flowing melodic tones can be both enchanting and intimidating at the same time. Enchanting enough for non-French people to strive to replicate its romantic-sounding inflections, but very intimidating when you listen to actual French people talk. No need to get intimidated for long though. 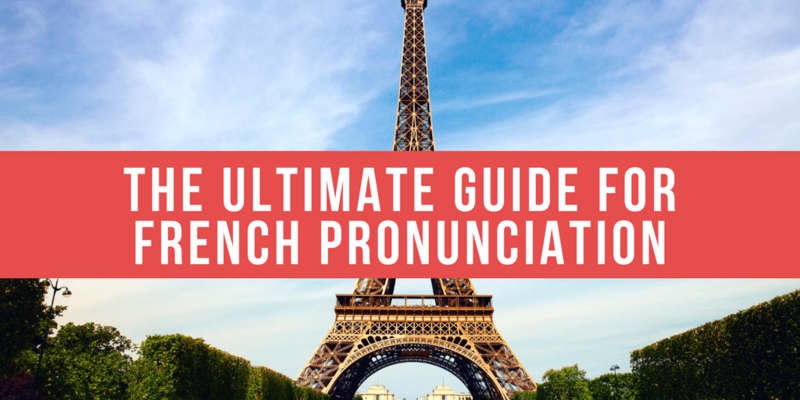 It seems like you're on the right track with learning how to speak French because this French pronunciation guide is solely focused on learning proper French pronunciation. Whether you are beginning to learn the language or you only need to brush up on your intonation, this is the perfect tool and guide for you to refer to every once in a while. Quick Navigation: What's in this Guide? Part 4. What Are French Nasal Sounds? Too busy to go through the whole article now? Simply click on the button below to download the French Learning Package. You'll find inside the pronunciation guide in PDF format and the audio files to practice your listening and pronunciation, too! Don't be too hard on yourself when you can't fully grasp the pronunciation rules after a few hours of practice. It takes time to learn how to pronounce French words properly – months, in fact. Besides, it's extremely rare to see a foreigner with a 100% correct pronunciation. Besides, does it really matter? France is a hugely multicultural country and the French people are quite familiar (and accepting!) with a wide range of accent. So don't beat yourself to a pulp, and just keep practising until you start to pull off French quite nicely. The study method and guide presented below are targeted for English speakers, and it will help you grasp the pronunciation rules better. It could get tricky for newbie learners, but with regular practice in speaking and reading, you should be able to to do quite well soon enough. Remember, you don't need to memorize these rules by heart, but by just referring to this page every once in a while, you'll get there in no time. So bookmark this page (or download the PDF) and study the guide as often as you'd like. It will be ingrained in your system before you know it. See the difference? Easy enough, right? For the newbie French learner, the difference between a, à, and â as well as e, é, è, and ê can get head-swimmingly frustrating. But the truth is, it's not actually that complicated at all. Here's a nifty guide for you to use so you could easily distinguish the pronunciation between the letters and all its mind-boggling accents or diacritical marks (or simply put, those little thingies on top of the letters). a and à are both pronounced like 'ah' in English. â is also like 'ah', except that it is longer. e when placed in the middle of a syllable is pronounced like 'ai' in fair, same as è and ê. Now we move to the consonants. Consonants in French are basically pronounced the same way as in English. But here are some rules for you to take note of, just to make things a little bit easier. It is produced by blocking air from leaving the mouth and released instead through the nose. These sounds are 'voiced' which means the vocal cords vibrate to create the sound. Sounds difficult? Not actually. In fact, the English language has three nasal sounds too, namely the m sound, the n sound, and the ng sound. And we are using these to speak flawlessly (or not!) everyday. as you pronounce the words, air is blocked when the back of your tongue presses against the soft palate. French has four nasal sounds which are more similar to its English counterparts than we realize. We mentioned that there are four nasal French sounds but you must be wondering why there are five listed. This is because some French speakers do not make distinctions between um* and im* and both are being pronounced as 'ang' like we do in sang. Now read up carefully because this here is where non-French speakers often get in trouble. Listed below are some pronunciations for syllables that, when spoken, differ quite well from how it is spoken in English. As an exception to the C,F,L,R consonants pronunciation rule presented earlier, L when used in the syllables ail and eil, are generally silent. For sure you're quite familiar with the gn sound already. Especially if you're the lasagna-eating type. We are all quite aware that the French language sounds flowing and continuous, or to put it jokingly, like speaking in cursive. This lends itself a lot of charm and that very noticeable melodic sound that foreigners simply love. If a word that begins with a vowel or a silent H follows a word which ends in a consonant, the consonant is linked to the beginning of the second word. Result: the consonant in the end of the first word is automatically linked to the beginning vowel of the second word. nous avons – the 1st word ends with the consonant s while the 2nd word begins with a vowel. un petit enfant – petit ends with a consonant while enfant begins with a vowel. Just like several other languages, French makes use of accent marks. Accents are a type of diacritic marks which are basically glyphs or small signs attached to a letter. These are commonly used in Latin-derived alphabets as well as non-Latin ones like Chinese, Arabic, Greek, Hebrew, Korean and others. the acute accent (é) or l'accent aigu which can be found in the letter e.
the circumflex (ê) or l'accent circonflexe which can be found in any vowel. In addition, there is also the cedilla (ç) or la cédille which can be found only underneath the letter c; and the diaeresis (ë) or le tréma which is often used to indicate that the second vowel is to be pronounced separately from the first (e.g. naïf—naive and noël --- Christmas). So what are accent marks for--what do they do? 1. They are used to change how a letter sounds. Let's take for example the letter e.
For the cedilla, remember the rule discussed earlier wherein c is only pronounced as a soft s when placed before an e or i? The cedilla totally changes that. Take for example the word garçon (which means boy). It precedes an o which means it should be pronounced as a hard c as in 'car', but the cedilla softens the letter to make it sound like s as in 'sit'. 2. Accent marks are used to differentiate between similarly spelled words which have different meanings. There's something very interesting about the accents though. In modern usage, French accents usually do not appear in capital letters because it is already deemed unnecessary. The Académie Française, however, maintains that it should be used at all times in order to avoid confusion. Contrary to popular belief, there isn't really a huge gaping difference between English and French pronunciation. In fact, most syllables are pronounced as though they are a part of an English word and are each given an equal stress. ng (italics) must never be pronounced; these letters merely indicate that the preceding vowel has a nasal sound. er (r italics) do not pronounce the r; this syllable sounds like er in 'her'. zh sounds like s in 'measure’. ü no equivalent in English; round your lips and say 'ee'. o sounds like o in 'not'. oh sounds like o in 'note'. The French Alphabet also contains 26 letters of the ISO basic Latin-script alphabet (or simply, the alphabet as we know it). It is basically similar to that of the English alphabet except for K and W which aren't always used. The pronunciation is also a bit different. So just in case you are planning to visit France soon, then you might want to practice spelling out your name should the French-speaking receptionist (or other people essential to your travel) require it. Spelling it out in French would make a lot more sense to them than the English phonetics. If your name is JANEY, it is spelled out as 'zheel – ah -- en – er – ee-grek'. Before we end this pronunciation guide, here are a few videos for you to check out. Never mind that some of the pronunciations are not 100% French, the important thing is that you are able to listen and compare it with your recent learnings. We wish you the best of luck in your French studies and don't forget to keep visiting this site for more useful information! For more information or comments, please don't hesitate to let us know. P.S. You would be doing me a HUGE FAVOR by sharing it via Twitter, Facebook or Pinterest. Practice your French pronunciation and listening skills with Talk in French products from the store such as these short stories with audio. Previous Post 50 Common French Phrases Every French Learner Should Know Next Post Birthday Traditions in France: How do the French Celebrate Birthdays?